The Strand Hotel i Sydney, Australien: Reservér nu! 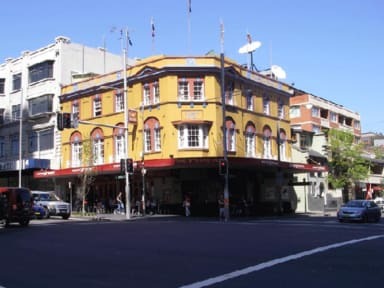 Situated only a short walk from the city centre as well as Sydney's world class tourist attractions including the Sydney Opera House, Royal Botanic Gardens and Sydney Harbour. Train stations and bus stops that will carry you to popular destinations like Bondi Beach and Darling Harbour as well as transport hubs like Central Station and Circular Quay are just a few minutes from our door. PLEASE NOTE: Persons under the age of 18 are not permitted to stay in the hostel. The hostel offers a selection of room types including 3, 4, and 6 bed shared dorm rooms as well as some private rooms. All our rooms feature beds with brand new mattresses (September 2016) and come with fresh laundered linen and storage lockers (locks not provided). Towel hire is available for a small refundable deposit. 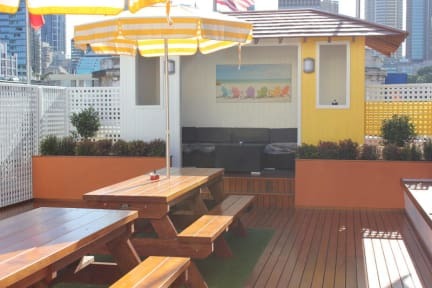 We have a brand new roof top sundeck area with a fully equipped kitchen featuring brand new large fridges, a microwave, stove top, oven, toaster and kettle. There is also a laundry with coin operated washers and dryers, as well as an iron and ironing board. Sit and relax in the warm Australian sun (don't forget your sunscreen and hat) or in the shade if you prefer on our sundeck. In the evening the lights of the Sydney city skyline provide a great backdrop as you mingle with other guests and make new friends. Please note we are only able to provide accommodation for people between the ages of 18 and 35. We do not accept guests under the age of 18, even when they are travelling with their parents or guardians. Our rooms are all non-smoking. Smoking is permitted on the roof top sundeck, but not in the kitchen or laundry. Sorry but no pets are allowed. I stayed at the strand hotel for 6days. It is the dirtiest hostel I have been in ever. There were no really social spirit here or no room to hang in. There is a rooftop terrace where the kitchen also is. The terrace is were the long termers sit and get high and the kitchen is for dishes and dirt and not for cooking. There were cockroaches everywhere. The rooms are also very dirty and on the 1. flor there is one toilet and bathroom for the ladies and it is smelliest room in world.